Every week we'll be reviewing the worst gambling beats, upsets and wild finishes in the NFL. Here is the rundown for Week 8. Every week we'll be reviewing the worst gambling beats, upsets and wild finishes in the NFL. Here is the rundown for Week 8. ## Gurley costs Rams backers, fantasy owners Just a few yards short of the goal line, Todd Gurley let up. And Rams bettors and Todd Gurley fantasy football owners let out a scream, "What are you doing?!" With a clear path to the end zone and less than a minute left in a two-point game - one in which the Rams were -7 - Gurley instead held up and let himself be tackled, knowing that, with no Green Bay timeouts left, it would end the game. Green Bay was the [top SuperContest consensus pick for Week 8](https://www.betchicago.com/fade-follow-podcast-aaron-rodgers-packers-supercontest), and the Packers drew a big handle as underdogs as the line moved from Rams -9.5 to Rams -7 during the week. ## FitzMagic Lives, Pt. 1 There were some bad beats in the early slate but the worst one came in the Buccaneers/Bengals game. For those holding a Bengals -3.5 ticket, your day was ruined by the legend known as FitzMagic. THe Bengals were cruising in this game, thanks in large part to the miserable play of quarterback Jameis Winston. When Jessie Bates picked off Winston and returned it for a touchdown, the Bengals took a commanding 34-16 lead. It was a good news, bad news situation for Bengals bettors. The good news was Cincinnati went up by 18 points. The bad news was after throwing his fourth interception, Winston was getting benched in favor of super sub, Ryan Fitzpatrick. Fitzpatrick did what he does. After a Buccaneers field goal, Fitzpatrick hit Mike Evans for a 72-yard touchdown to cut the lead to 34-26. All of a sudden a blowout was down to a one possession game. When the Bengals' offense couldn't get anything going, FitzMagic got the ball back with a chance to tie the game. THe writing was on the wall. 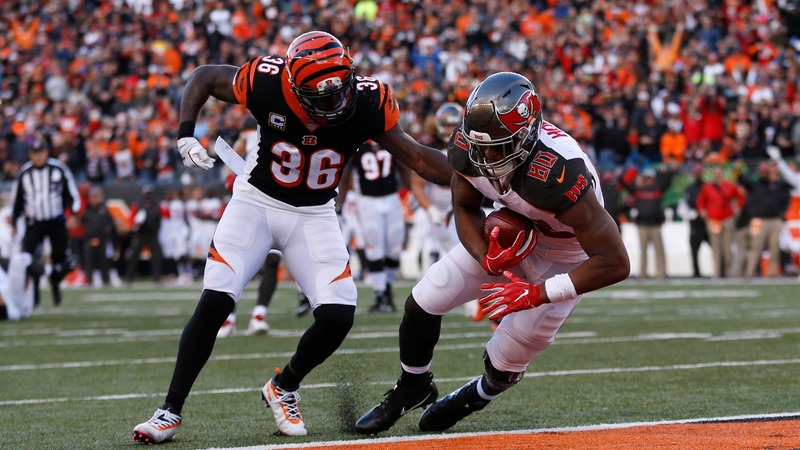 Fitzpatrick drove the Buccaneers down the field but faced a 4th and 3 from the Bengals' 18-yard line. With the game on the line, Fitzpatrick hit tight end O.J. Howard for a touchdown. After a successful two-point conversion, the game was tied. Now, Bengals -3.5 bettors needed the game to go into overtime. However, FitzMagic doesn't play defense and Tampa Bay has one of the worst units in the NFL. Andy Dalton had 58 seconds to work with and that was more than enough time to drive the Bengals down the field. Randy Bullock drilled to give the Bengals a 37-34 win and Cincinnati bettors a crushing loss. An 18-point lead with 17 minutes left up in smoke. ## FitzMagic Lives, Pt. 2 In the afternoon, it was Larry Fitzgerald, as the veteran Cardinals wideout scored on a touchdown pass from Josh Rosen with under a minute left to upend a San Francisco 49ers squad that had led for the duration in an 18-15 win. The game moved from a pick-em to 49ers -2.5 during the week as bettors bet against the Cardinals' woeful offense. ## Two late scores bury Browns/Steelers UNDER bettors Thank God for gambling. Most of the early matchups were blowouts but because of the side and total being in play, the games went down to the wire. That's what we had in Pittsburgh where UNDER bettors were sitting pretty with the score at 26-12. Things got dicey when James Conner scored on third down to push Pittsburgh's lead to 33-12 with just over two minutes remaining. The Browns got the ball back and drove down the field to the Steelers' 24-yard line. It was 4th and 6 with only 18 seconds to go. One play for all the marbles. Baker Mayfield fired a strike to backup tight end Seth DeValve for a 24-yard touchdown with just six seconds left on the clock. Seriously, it was Mayfield's best throw of the day to sink UNDER bettors. Two touchdowns in the final two minutes put the game OVER the total. ## Broncos sneak in the back door All good things must come to an end. The Chiefs came into Sunday a perfect 7-0 ATS. That streak ended in heart breaking fashion for bettors holding a Chiefs -8.5 ticket. The Chiefs took a 30-14 lead late in the third quarter in a game that looked like a laugher. Kansas City bettors weren't laughing for long though when Denver scored to cut the lead to 10 to kick off the fourth quarter. The good news was Denver opted to go for two and failed, still giving Broncos bettors a cover. In a game where the Chiefs' offense was scoring at will, it didn't seem overly concerning. Until the Chiefs stopped scoring. With Kansas City's offense sputtering, the Broncos went on a drive late in the fourth quarter with the Chiefs playing a bit softer on defense to protect the lead. Denver's drive stalled inside the 10 but down 10, they needed a field goal. Brandon McManus' field goal drove a stake through the hearts of Chiefs bettors. Amazingly though, KC backers bad one final opportunity. The Broncos got the ball back for one last play and started lateraling the ball all over the field. It wasn't meant to be though, as the ball went out of bounds and the Chiefs' undefeated ATS came to an end. ## OVER bettors turned away in Detroit Those who bet the OVER 48 in the Lions/Seahawks game must have been pulling their hair out late in the fourth quarter. The Lions scored with 10:40 remaining to make the score 28-14. OVER bettors needed one more touchdown and it looked like they would get it when the Lions had a first-and-goal from the 4-yard line with 3:11 remaining. Four shots for a touchdown and win. The only problem was Matthew Stafford had other ideas. Stafford threw a terrible interception on first down, killing the Lions' drive. OVER bettors then got another shot when the Seahawks ran a fake punt out of their own end zone. The Lions just needed to tackle punter Michael Dickson and they would have another first and goal. Instead, Dickson ran for a first down and the Seahawks were able to run out the clock. OVER bettors came up just short.